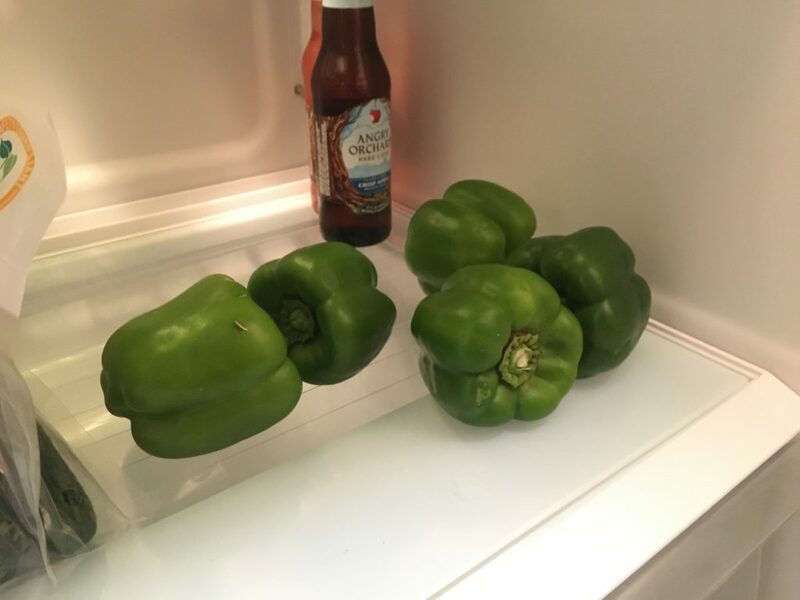 My refrigerator is full of green peppers. I like to take them for my lunch. Lately I haven’t gotten around to eating them at lunch time, so I eat them on my drive home from school. I tear them in half, pull out the seeds and core, and crunch away. It’s really nice, because by the end of the day, my mouth is kind of dry and coffee-tasting. The crunchy green pepper is refreshing and leaves a clean feeling in my mouth. Yay peppers! Your refrigerator is so clean and minimalist – it looks like an ad for healthy living. I’ve had a similar mouth issue – by the end of the day I just want to scrub my whole mouth. Maybe I need to buy some peppers…..
Oh, I love peppers, too. However, my preference is for the yellow ones. The orange and red ones aren’t quite as sweet. Green peppers are slowly growing on me.